The problem of Hybrid Linear Modeling (HLM) is to model and segment data using a mixture of affine subspaces. Different strategies have been proposed to solve this problem, however, rigorous analysis justifying their performance is missing. This paper suggests the Theoretical Spectral Curvature Clustering (TSCC) algorithm for solving the HLM problem and provides careful analysis to justify it. The TSCC algorithm is practically a combination of Govindu’s multi-way spectral clustering framework (CVPR 2005) and Ng et al.’s spectral clustering algorithm (NIPS 2001). The main result of this paper states that if the given data is sampled from a mixture of distributions concentrated around affine subspaces, then with high sampling probability the TSCC algorithm segments well the different underlying clusters. The goodness of clustering depends on the within-cluster errors, the between-clusters interaction, and a tuning parameter applied by TSCC. The proof also provides new insights for the analysis of Ng et al. (NIPS 2001). G. Lerman, J.T. 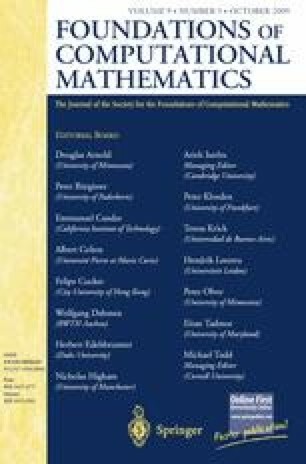 Whitehouse, High-dimensional Menger-type curvatures—part I: Geometric multipoles and multiscale inequalities (2008, submitted). Available from http://arxiv.org/abs/0805.1425v1. G. Lerman, J.T. Whitehouse, High-dimensional Menger-type curvatures—part II: d-separation and a menagerie of curvatures. Constr. Approx. (2009, accepted). Available from http://arxiv.org/abs/0809.0137v1.